BlogPaws 2013! 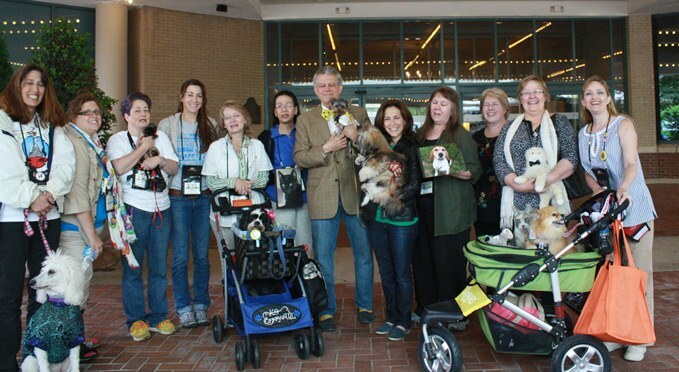 If you're going to be a pet blogger, you need to go to at least one BlogPaws. This was my first, and the excitement was high for this. Seeing all my friends again, and meeting people I've only talked to online, was so exhilarating. And I learned so much from the conference too! 1) Cross-pollinate. The pet industry is huge, and the pet presence is huge online. If we work together, we can make a bigger difference in the lives of pets. But instead, there's lots of fighting, lots of animosity, lots of isolation between different groups of pet people -- rescues, bloggers, cats, dogs, etc. We need to break down those barriers. Steve Dale delivers a keynote address Friday morning at BlogPaws. 2) Misinformation is a problem. Steve Dale, a syndicated pet writer, and keynote speaker, says fewer people are taking their pets to the vet -- especially cats. That may be because people feel they can't afford it, but Steven also feels that people are getting misinformation online. I suppose it makes sense. More people are using WebMD and trying to treat themselves instead of going to the doctor (in a story recently, a woman delayed taking her son to the hospital for a gunshot wound for hours while she looked up info online.). It stands to reason people would do the same for their pets. There is also a lot of fears about vaccinations. As pet bloggers, it is incumbent upon us to be rational, and provide the best, most accurate info we can, because readers are looking to us for tips for their pets. 3) Diabetes is way up among pets. Diabetes is a big issue in my family. On top of my Dad and other family members living with this disease, we lost two cats to it. But while there are a lot of people looking at cancer (another growing problem) among pets, I've not seen much about diabetes. I plan on working to raise awareness this summer. What is causing it? How can we prevent? Can our pets live a good life with diabetes? 4) ASPCA has a place in the pet world. There is a lot of resentment toward ASPCA. There is good reason. ASPCA gives very little money to shelters, and has made some questionable actions in the name of helping pets. However, they are the lobby for the pets. And they are up against some stiff, well-moneyed competition. As ASPCA expands its lobbying efforts into more states, it's up to us to work with them in the hopes of bettering the lives of all animals. 5) There's a Congressional animal protection caucus. Did you know that? There's a group of about 80 lawmakers who have the interests of our pets at heart. We need to make sure they know what our priorities are. Find the members of the caucus here. Is you congress person on the list? Let them know you want them to be! 6) Write more. We are often told not to write posts longer than 500 words, and I've been following that -- somewhat. But the more you write, the more people link... especially if it's good and in-depth. Do you feel I provide good content on my blog? Please let me know if you think I can improve. 7) There are lots of good resources online. I can make slideshows and post video and make infographics. I just don't use a lot of those tools. But I plan to. Dexter the cocker spaniel means Charles the monarch. 8) Network more. I went to BlogPaws to network, and network I did. Good gravy! But I have to network more online too. I need to post more on other people's blogs and share people's posts. It's a reciprocal thing. 9) Become a clearinghouse for what's out there! From pet360.com to HABRI to Petfinder, there's a wealth of information out there and things that can help you get a pet, raise a pet, have a special bond with your pet, and help others too. 10) Being with other people's pets makes me miss Lulu. I couldn't bring her to BlogPaws. She stayed with my parents while I was at the conference. I missed her a lot. And she missed me. 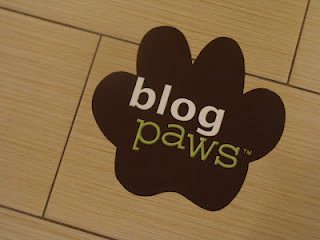 Were you at BlogPaws? What did you come away from the experience with? Good to meet you. 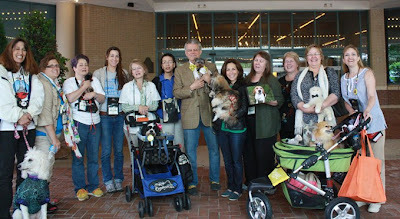 Just did a summarized blog post about BlogPaws. Had a wonderful experience as a newbie too. Golden Woofs. Hey! It was great getting to meet you too! I will check out your post! Thank you for sharing your Blog Paws experience with us. It also makes me more jealous that I didn't get to go this year. I had no idea that pet diabetes is at a high. Diabetes runs in our family, but it never occurred to me that my dogs could get it too. Dogs and cats. :( one has to wonder if diet is part of it. Great dawg, Ma wishes she could've gone to BlogPaws and your post just made her jealousy grow. BOL So glad you brought home all this great information and are sharing it with those of us who did not/could not attend. It's true that if we bloggers banded together more often we could accomplish a LOT of great things. You'll be at Barkworld! We'll get lots of stuff to learn there! Good recap. I didn't attend the session on vets and bloggers "getting along" and didn't realize there was a divide there. I do know there are clearly dog vs. cat blogger camps. I don't see it was a "war" but I do see that the one doesn't know what the other is doing but if they did they might be even more effective. I didn't get to the blogger vs. vet session, but I wanted to. Thanks for a great post. I've been trying for a week to write about what I came away from BlogPaws with and still can't get it together. There's just so much. I know I definitely need to write more and "step out of my shell." BlogPaws helped with that tremendously. Your point about the ASPSA is nice to see. We all need to work together for the benefit of the animals. I hope to see you at Bark World! I will be there! I know what you mean about coming out of your shell. I have the same problem. Sometimes I hit periods where I can't get what I want to say on the screen. My therapist and I are working on it. Great post! I will be so glad when we can watch the conference videos of all the sessions we could not attend. I am working harder on doing some of the things that were recommended during the sessions. I sure am glad we are friends so we can watch each other grow. See you and LULU at BarkWorld! Me tooo! I missed so much I wanted to see. Glad you made it home okay! Good synopsis! My mind has been buzzing since BlogPaws and I'm still trying to figure out what I want to put into action. I can't wait until the videos are done so I can see the sessions I missed. Feline diabetes is a huge interest of mine having adopted 3 diabetic cats. It's also why I will always recommend wet food for cats because diet plays a HUGE part in cats developing diabetes (along with obesity which is also diet related). If you are looking for any feline diabetes resources let me know. I agree with all of it, but especially the last point. I find that connecting with a dog that reminded me most of my own babies got me through. Definitely. And I know I was not alone in that. It was the first time I really experienced. That would be a lot of fun to go to the conference! It must have been great to meet everyone in person that you usually talk to online. It was amazing! you should try to make it to a conference in your region. Where do you live? Clapping my paws and giving you a standing ovation! Thank you for your candor!!! I also experienced the first point you referenced. So much so that I blogged about it on Cat Chat this past week in my "BlogPaws Bits and Bites Post"....I witnessed more "cliquish" behavior than I care to remember...even ostracizing those in one's niche. Ridiculous, High School behavior. Soooo your point number one resonated with me: "1) Cross-pollinate. The pet industry is huge, and the pet presence is huge online. If we work together, we can make a bigger difference in the lives of pets. But instead, there's lots of fighting, lots of animosity, lots of isolation between different groups of pet people -- rescues, bloggers, cats, dogs, etc. We need to break down those barriers." I feel bad, because I was a little cliquish myself. We need more time to socialize!!! Wonderful post Christie!! I am so glad you wrote this up to help me remember all the important things I learned at BlogPaws. I am glad you have been reunited with Lulu! I hope we get to see you again (and Lulu for the first time) sometime soon! You should come to Barkworld! I've really enjoyed reading everyone's post-Blogpaws posts and learning from them...Today is the first time I've heard of the Congressional Animal Protection Caucus...Thank you! Cool! I think most of the ppl in the ASPCA session were rescues and not bloggers. There was a lot of stuff I knew already, but the stuff I learned was really interesting. Great post! I learned a lot while attending but your post had information I missed. Thanks for posting. We did not get a chance to meet you. I look forward to meeting you at the next BlogPaws conference. We met, Venus! It was either Thursday night or Friday morning. You and Cinnamon were hanging with Carol and Bunny, I believe. Feel free to leave me feedbark! Get more Life With Beagle news! Sign up for our newsletter. Merry Christmas from Pooch Smooches! I'm 9 years Old Today! Star Wars Day: May the fourth be with mew! Copyright Christie Zizo 2016. All Rights Reserved.. Powered by Blogger.